A Volume Shadow Copy (Previous Version) snapshot allows you to view the content of your folders and documents as they existed at a previous point in time. A snapshot looks like a read-only disk volume. The files and documents cannot be modified. U-Recover lets you create a volume snapshot that can be viewed from within Windows Explorer just like on Windows 7. Click or tap on the tab Create (top). Choose the volume for the volume snapshot (for example C:). Click or tap on the link Create. U-Recover will create the snapshot. If an error occurs U-Recover will display a message box that explains the reason for the error. Click or tap Ok to continue. After the snapshot is created you can click or tap on the tab Expose (top) to expose the newly created snapshot as a new temporary disk letter (for example, E:). The new volume will be read-only. If the link Create is not displayed for a given volume, it means that the volume has no space reserved for storing volume snapshots. To allocate space, click or tap on the link Manage. See Managing Volume Snapshots. 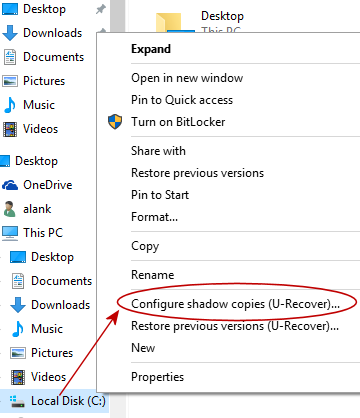 If you selected the installation option to Integrate U-Recover with Windows File Explorer you can launch U-Recover using the Explorer right-click menu. Navigate to the root of the disk volume (for example, C:). U-Recover will automatically navigate to the panel for managing volume snapshots on the indicated disk volume. Click or tap on Back, then click or tap on Create to create the volume snapshot.